We have already discussed the withdrawal facility for three major retirement products- Employee Provident Fund (EPF), Public Provident Fund (PPF) and National Pension System (NPS) in previous articles. Now it is logical to understand and discuss the tax implications for such withdrawals. Presently, this is one of the very good product for retirement due to its tax exemption at all the stages. The money invested gets you deduction under Section 80C. The interest accrued on the PPF account gets you exemption under Section 10. In case you take a loan from the PPF account, the interest paid on such loan can be claimed against your business income if the funds are used for your business. However if the funds are used for your personal purposes, no tax benefits are available. The money withdrawn partly or fully before completion of its original tenure of15 years are fully exempt in your hand. The maturity proceeds are also fully exempt under the income tax laws. The exemption in respect of interest is available during the currency of the original tenure of 15 years of PPF account and during extension period as well. Interest received on PPF account is also exempt in case the PPF account is not extended and the maturity proceeds are not withdrawn fully at one go and the balance earns interest. The money withdrawn from your EPF for the permitted purposes like purchase of land, purchase/construction of house, repayment of home loan, education of children and marriage and medical treatment of family members is fully tax exempt in your hand. Even in case the money is withdrawn due to being jobless for certain period of time or for due to non receipt of salary would also be exempt provided the money is withdrawn after you have contributed to the EPF account for minimum of five years. It is not necessary that the contribution to the EPF account should have been made under the same employer. Even in case you have left an employer and have transferred the EPF balance to the EPF account under new employer, the money withdrawn would still be exempt provided the aggregate period of contribution under one or more employer taken together exceeds five years. In case the balance in EPF account is withdrawn before five years the entire money received becomes taxable in the year in which the money is withdrawn. However in case the money is withdrawn before five years due to termination of the services of the employee due to his illness or closure of the business of the employer the money even if withdrawn before completion of five years would still be tax free. 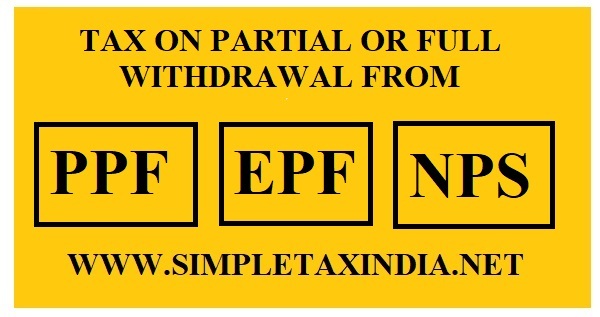 Likewise in respect of money withdrawn from EPF and transferred to NPS such withdrawals would be fully tax free. The payer of the money withdrawn from EPF account, in case the same is withdrawn five years, will deduct tax at source @ 10% in case the aggregate amount of such balance exceeds 50,000/-. The money withdrawn at the time of retirement is fully tax free in your hand. However in case you do not withdrawal the full balance at the time of your retirement, any interest credited to your EPF account after retirement/resignation will become taxable in your hand as per a recent ruling of an Income Tax Tribunal. Money withdrawn from NPS account at the time of retirement or reaching the age of 60 years is exempt only upto 40% of the accumulate balance. The subscriber is under an obligation to buy annuity from an insurance company to the extent of 40% and for the balance 20% he has the option to either buy the annuity or withdraw it and pay tax on it. As the scheme allows you to withdraw the money in full if the accumulated corpus is less than 2 lakhs, you still have to pay tax on 60% of such withdrawals as only 40% of the accumulated balance is only exempt. Like EPF the NPS rules have been recently modified to allow partial withdrawals for specified purposes. However unlike EPF where the money partially withdrawn is fully tax exempt, the partial withdrawals from NPS account are exempt upto 25% only and the balance 75% will become taxable in your hands.